"I been lookin' for a girl every Saturday night o' my life, I'm thirty-four years old; I'm just tired o' lookin', that's all." 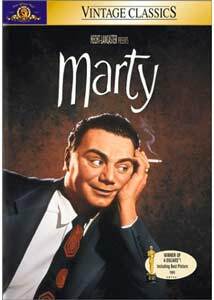 Ernest Borgnine stars as Marty Pilletti, a stocky 34-year-old butcher who lives with his mother and has never had a real relationship with a woman. He feigns disinterest to his friend Angie (Joe Mantell), while admitting to his mother (Esther Minciotti) his fear that no woman would ever have him. A glimmer of hope comes from a chance encounter at the Stardust Ballroom with Clara Snyder (Betsy Blair), a plain, intelligent chemistry teacher abandoned by her heel of a blind date. But can he overcome his mother's fear of abandonment, Angie's misogyny, and his own lack of self-confidence? Director Delbert Mann brought Paddy Chayefsky's television play to the big screen in 1955, with Ernest Borgnine in the role played by Rod Steiger in the 1953 original. Mann's direction opens the play up dramatically, with an active camera that carries the action into Marty's home, the Stardust Ballroom, Michael's bar, Tommy and Virginia's apartment, and the streets of New York City, while retaining Chayefsky's powerful, honest dialogue. Careful compositions help to communicate Marty's emotional state, with deep-focus shots that emphasize the distance between where he is and where he wants to be. Ernest Borgnine won an Academy Award® for his incredible performance, full of frustrated outbursts, half-hidden dreams and palpable need; the role made him a star. He finds the emotional core of the beefy, inarticulate, kind-hearted, lonely Marty, and brings it out onscreen with complete commitment and sensitivity. Betsy Blair is equally impressive as Clara, with a quiet exterior that masks her own fears, not so very different from Marty's. Esther Minciotti plays Marty's Italian mother with authenticity, and Jerry Paris and Karen Steele as Marty's cousin Tommy and his wife Virginia make a credibly unhappy couple trying to live with Marty's nosy, disapproving, often very funny aunt Catarina (Augusta Ciolli). Marty is touching without being sentimental, moving without being manipulative. The film won four Academy Awards® (Picture, Actor, Director, and Screenplay) and holds up very well today. A love story of the most grounded sort, it makes the heart sing just the same. Image Transfer Review: Marty is presented in 1.33:1 full-frame format, an acceptable match to its 1.37:1 theatrical aspect ratio. The source print exhibits some scratching and speckling in a few sections, with small flecks common throughout. The digital transfer captures the black-and-white film with fine contrast and crisp detail on fabric and wood textures, sharp enough to foreshadow dissolves with a visible softening as the optical effect kicks in. I wish the film could have been cleaned up a bit, but the DVD presentation is solid. Audio Transfer Review: MGM presents Marty in its original monophonic audio format, presented in Dolby Digital 2.0 for ProLogic-decoding to the center channel. The English soundtrack is audibly dated, with reedy music during the opening credits and a few muddied lines of dialogue; the optical soundtrack has also suffered audible damage in one speckled section of the film. Still, Marty sounds better than many films of its vintage, with remarkably little hiss, perhaps due to some effective electronic cleanup. French and Spanish mono tracks are also available, but the voice-over acting doesn't even come close to Borgnine's original performance—better to use the English soundtrack with Spanish or French subtitles. Extras Review: Unfortunately, Marty on DVD features no substantial extras, just 16 picture-menu chapter stops and the original theatrical trailer. The trailer is interesting in and of itself—it's hosted by Burt Lancaster, who co-produced the film and was presumably a more marketable presence in 1955 than any of the film's stars. Thus, Mr. Lancaster appears on screen to introduce the Marty trailer, admitting, "No, I'm not in it," and narrates over clips from the movie, emphasizing his enthusiasm for Ernest Borgnine and Betsy Blair. An unusual marketing approach, nice to have as part of the official record on DVD. Marty is a true classic, an unconventional romantic drama with tremendous emotional depth. MGM's DVD provides a decent presentation of the film, though supplements are almost non-existent. But the film itself makes this disc highly recommended.